Daisy the Curly Cat: I am Fuzzy! Since I am a Devon Rex kitty, I have fuzzy-wuzzy hairs that go every which way. I am not smooth and silky, but more fuzzy and soft like a well-loved teddy bear. I even have funny, frizzledy hairs inside my ears! 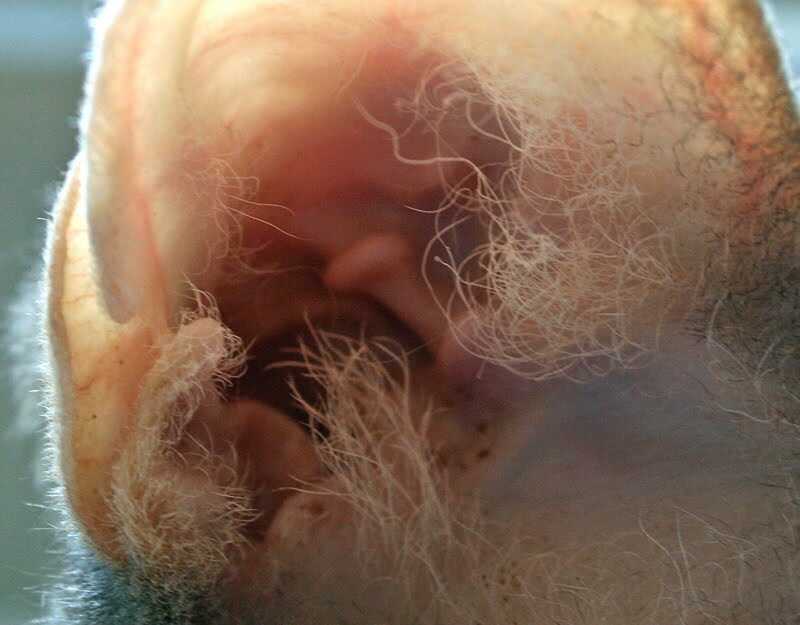 Here is a close up of my ears. I think there is some wax in there, too! And you give us a warm and fuzzy feeling, Daisy! The only thing better than a well-loved teddy bear is a well-loved kitty! Great photos. We like your curly ear furs, Daisy...and your wax! Daisy, that first picture is just lovely. That is one of our favorite pictures of you. We are sending tons of purrs that your test results are good today. Take care. You ears are furry cute Daisy. fuzzy wuzzy was a... cat? You are wonderfully fuzzy Daisy! We think fuzzy looks good on you! Mommy thinks your eyes are beyootiful and I agree! We hope you pass your test! Keep us updated. Purrs. Some peoples like to notice we furs too! We is both cockapoos but my furs is more cocker and Aswell's is more poo!!! Ha ha ha!!! Aswell is a poo-puppy!! I like your fuzzy ears, Miss Daisy. But I especially like to see your curly whiskers. I'll bet they're very tickley. we love your curly fuzzy furs! We like your fuzzy wuzzy furrs Daisy. Daisy, your mom got some amazing photos of your and your ears!! We sure hope your test reports will come back saying you are fine and healthy. Thanks for all the good advice and purrs. My sight is returning. Daisy, that is not nice of your human to take photos of your ears if they are dirty! 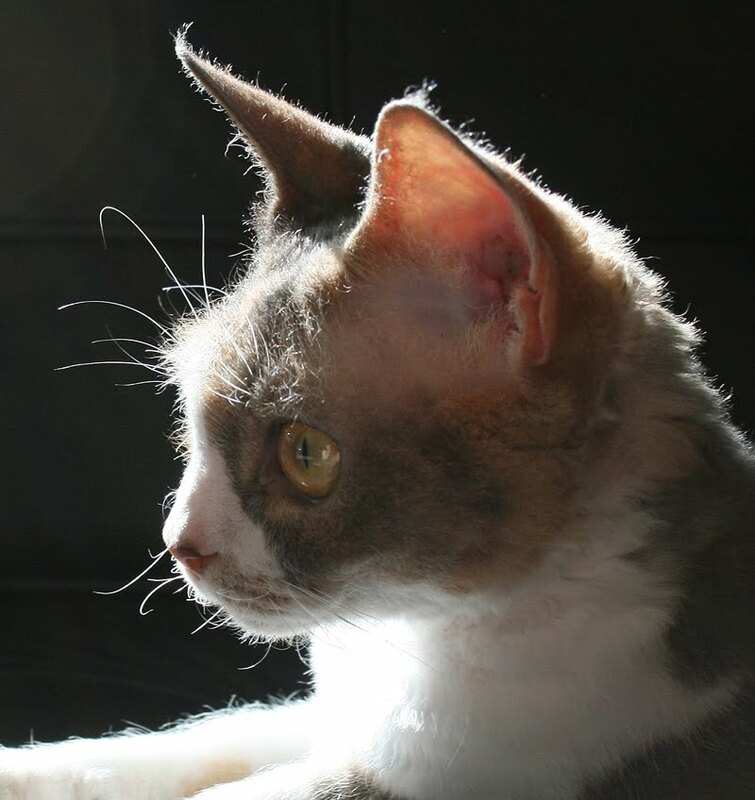 My human has never petted a Devon Rex, but she has hung out with a Cornish Rex and says their fur is lovely to touch - like lamb fur! Is yours kind of like that too? You are such a cute Fuzzy girl Daisy !!! Daisy, you gots such sweet fuzzy! And, you need to know you are in danger! You be in danger of getting wuzed and cuddled up by our Mumsy! "...more fuzzy and soft like a well-loved teddy bear." That is so sweet, Daisy, we love that line! You are very cute with all of your curly furs! Daisy, your furs are very special just like you! Our mommy wishes she could feel your fuzzy wuzzy furs! Daisy you are a true fashionista as the fuzzy look is in demand and you pull it off quite well. You are as a loveable as a fuzzy soft teddy bear! I wonder if I can get a perm to make my furs look like yours! (¸.•´ (¸.• ♫ ♪ Miss Daisy, you are certainly a very photogenic. Hmmmm! Very interesting! 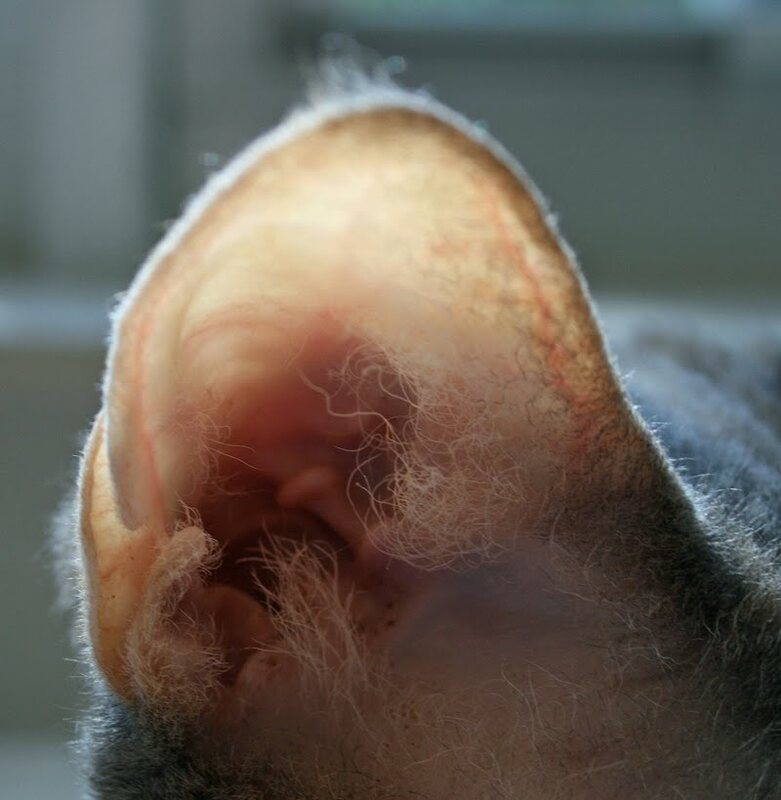 It's not often I see pictures of kitties' inner ears on their blogs. Your furs are very different indeed. No wonder you are called "Daisy the Curly Cat". My gosh I guess you are a curly cat! As you can tell, we is just cat-chin up visiting! We Cornish and even Disco the Sphynx have the same grizzled hairs in their ears, too. Teri lurves it!